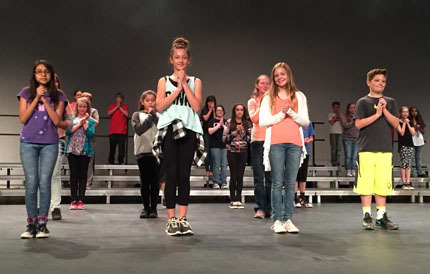 Choir students from Zia Intermediate School sing and dance during a rehearsal for the annual Zia Zing, directed by Patty Schafer and assisted by Delecia Miller. The performance will begin at 6 p.m. Thursday at the Artesia High School Auditorium. Tickets will be $5 for adults, $3 for children, and $10 for families.